The beautiful community of Midlothian is located just 26 miles outside of Dallas. The small town and quiet streets exude the kind of charm and warmth one expects in a small southern town. Fields of Wildflowers and grazing cattle are no uncommon sites in the area. The prosperous community is more than a small town. The town also operates as a major manufacturing hub for the cement industry in the region of North Texas. In keeping with the town's reputation the community is currently home to a steel mill, as well as three separate cement production facilities. In the early part of the 1800s, settlers began arriving in the area that would one day become Ellis County. The area's growth was slow at first but took off in the later part of the 19th century. The first home in the area was built in the year 1848 and Ellis County was soon established the following year in December of 1849. In 1883 the name for the growing community was was accepted among the local population and the town was officially incorporated in April 1888. The town provides residents with opportunities to exposed to a diverse array of recreational, cultural and educational facilities. Recreational programs are available for youth, seniors and every age in-between. In this very special town you can expect an abundance of beautiful green spaces and and wonderful parks. Community Parks include, Kimmel Park, Mountain Peak Park, Jaycee Park and the Community Sports Complex. As a part of the Dallas-Fort Worth area, residents have access to the many attractions in the surrounding area. The town's access to major transportation routes such as -20, I-35, I-45, U.S. 67 and U.S. 287 allow residents to stay easily connected with all that the Dalls-Fort Worth area has to offer. Nearby attractions include: Six Flags Over Texas, The Fort Worth Zoo, Hurricane Harbor, Dallas Zoo, Botanical Gardens of Ft. Worth, and The Dallas Arboretum. The town is home to a wide array of community events and activities. Throughout the year, the community holds events for the pleasure of locals as well as he surrounding communities. Popular events include the Fly-In Breakfast at Mid-Way Regional Airport, the Fourth of July Fireworks, the Fall Festival and the Southern Star Christmas Celebration. If you are interested in relocating to this charming small-town community, please contact Donna Lasater today. 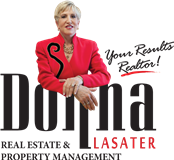 Donna is an expert in the local real estate market and has access to information on homes for sale, as well as other types of properties available in the area. Contact Donna Lasater for more information!